Paris, Jan 23, 2019 – Danone Communities, the Company's investment fund and social business incubator for low-income population, announces a new investment aiming for the development of access to safe drinking water in Africa, starting with Senegal. Danone Communities keeps supporting an innovative and decentralized model for water provision via "water kiosks", thus contributing to the UN's Global Sustainability Goal #6. 4 billion people worldwide do not have access to safe drinking water. Today, Danone Communities announces a new investment in a social business which mission is to develop access to safe drinking water, with an affordable price point. This new investment is Oshun, operating in Senegal, with an ambition to have a global footprint in Africa. Staying true to Danone's mission to bring health through food to as many people as possible, with innovative business models and partnerships, this investment strengthens Danone Communities' ambition to support an innovative model of access to safe drinking water. Amaury de Roujoux, business development water & finance Director at Danone Communities commented: « This investment in Oshun broadens our portfolio of social businesses focusing on access to safe drinking water. With Oshun, we can now demonstrate that affordable and qualitative equipment is indeed a sustainable solution in rural areas, when they are used within an inclusive economic model. This technical solution and Oshun's expertise with rural areas will open up to new consumers markets». Danone Communities has been a catalyst in spreading the pioneering model called Safe Water Enterprises (SWE). The approach is proven to be a cost-effective mechanism to deliver safely treated drinking water to poor communities and has already benefited 3 million people. A recently conducted study shows the untapped potential of the SWE model that could benefit 200 million people. In pursuit of this goal, Danone Communities is calling for wider adoption of the SWE model and further collaboration to help scale the model so more people and communities can benefit from safe and sustainable water. Oshun : an investment in a very innovative social business, contributing to the UN 6th Sustainable DEvelopment Goal. Danone Communities already invested in 10 social businesses operating accross 14 countries, with 1 million daily consumers. - MIOS, specialized in "Machine to Machine" products and hardware communication solutions, based in Aix-en-Provence. Oshun's purpose is to develop accross Africa, beginning with Senegal, a safe drinking water service around the Providence range, mobile water treatment devices designed to meet the needs of rural populations. This solution is autonomous in energy via solar panels, easy to transport and maintain, communicates intelligently and allows users a dematerialized payment by SMS. Providence equipment is also available for sale or lease. 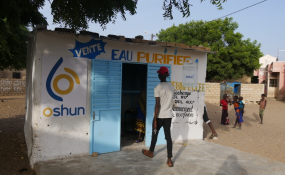 With 30 kiosks, Oshun water is already impacting 20.000 people, living in rural areas of Senegal. Oshun's business model is based on the development of local entrepreneurship to create both access to drinking water and jobs, especially for women. a day with aspirational products and services addressing malnutrition and lack of access to safe drinking water. Danone Communities empowers innovative social entrepreneurs to achieve sustainable social impact. It does so by investing in social businesses as a minority shareholder, providing capital, technical and managerial expertise. throughout the years from Senegal to Mexico. To date, the portfolio consists of a total of 10 social business investments made in 14 countries with 1 million beneficiaries. Danone Communities is a catalyst in spreading the Safe Water Enterprise model, also known as water kiosk model with 5 investments in 8 countries where it is being replicated. Danone Communities has long been convinced in both the business and development case for investing in WaterKiosks. The key highlight of the study finds that SWEs –these "alternative solutions which provide a modular, decentralised approach to delivering safely treated drinking water"– have the potential to be "a significant part of the safe water solution on a global scale as a cost-effective mechanism to serve the poor."